When Monisha Rajesh announced plans to circumnavigate the globe in eighty train journeys, she was met with wide-eyed disbelief. But it wasn’t long before she was carefully plotting a seven month long adventure across a route that would cover 45,000 miles, coasting along the world’s most remarkable railways. – almost twice the circumference of the earth –from the cloud-skimming heights of Tibet’s Qinghai railway to silk-sheeted splendour on the Venice Simplon-Orient-Express. Packing up her rucksack – and her fiancé, Jem – Monisha embarks on an unforgettable seven-month-long adventure that will take her from London’s St Pancras station to the vast expanses of Russia and Mongolia, North Korea, Canada, Kazakhstan, and beyond. The ensuing journey is one of constant movement and mayhem, as the pair strike up friendships and swap stories with the hilarious, irksome and ultimately endearing travellers they meet on board, all while taking in some of the earth’s most breath-taking views. 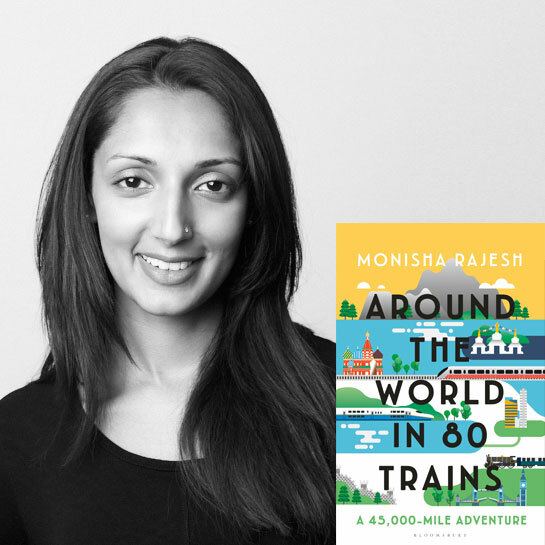 A warm and witty travelogue documenting Monisha Rajesh’s journey, celebrating the glory of train travel and exploring what it means to be a global citizen.